The driver of an articulated lorry was stuck for more than three hours on a tight bend in Carmarthenshire, after taking directions from his sat nav. 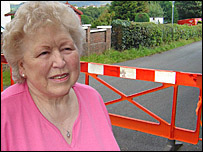 Residents have called for more signs, saying it was the third time that Cwmferrws Road has been blocked in recent months. 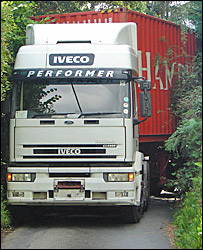 The lorry, believed to be from Poland, was wedged between a garden wall and a hedge between Tycroes and Saron. The driver refused to comment but told residents he had been using sat nav. Police were called to the scene around 14.30 BST. Resident Ian Thomas said foreign drivers sometimes had trouble understanding the signs. "I was mowing the lawn when I heard the lorry going down the hill with a screech of brakes. "Every time he was trying to come back he was hitting the wall. "It's the third time it's happened in a matter of a few months." Elizabeth Jamieson, whose garden wall was hit by the vehicle, said: "I looked out of the front window and I saw this red thing at the bottom of my garden. "When I walked down I could see it was a lorry - from Poland I understand - he could not move one way or the other. "It's a very nasty corner but it was far too big for this road. "We have notices at the entrance to say the road will not take heavy lorries. "I understand he has been in touch with his company and he has been given the sack. "Maybe the council will have to do something about it now." It is not known where the lorry was heading for. The driver refused to comment.